A recent study from the atmospheric scientists at the University of Hawaiʻi at Mānoa revealed that although they are microscopic, gasses and particles from Kīlauea volcano exerted an influence on Tropical Storm Flossie—affecting the formation of thunderstorms and lightning in the sizable storm. In July 2013, as Flossie approached the Hawaiian Islands, satellites steadily monitored lightning, rainfall, cloud cover, temperature and winds, In addition, UH Mānoa graduate assistant Andre Pattantyus and Atmospheric Science Professor Steven Businger dutifully maintained their vog model—a forecasting tool Businger has operated since 2010 to provide guidance on the location of the vog plume and the concentrations of sulfur dioxide (SO2) and sulfate aerosol for Hawaiian Island communities. 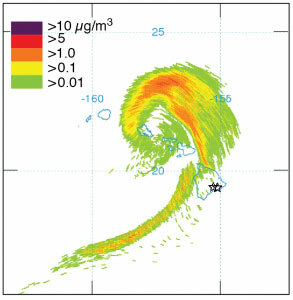 Businger and lead author Pattantyus found that prior to Flossie’s passage over the island of Hawaiʻi, the observation network detected no lightning in the storm. Though one hour later, vigorous lightning flashed in the vicinity of the Island of Hawaiʻi as Flossie approached. Further, as volcanic emissions were wrapped into this moist environment, sulfate aerosols promoted the formation of a greater number of smaller than normal cloud droplets, which favored charge separation in the upper cloud region and the occurrence of lightning. Sulfate aerosols have previously been identified as a principle component of cloud condensation nuclei, a necessary ingredient for forming raindrops. “This is the first interaction between an active, vigorously degassing volcano and a tropical cyclone captured by a vog model run over the Hawaiian Islands—providing a unique opportunity to analyze the influence of robust volcanic emissions entrained into a tropical storm system,” said Businger. Taken together, the observations and the vog model highlight an intimate interaction between Tropical Storm Flossie and Kīlauea’s vog plume during the passage of the storm. The observations of Flossie’s changing dynamics as it encountered Kīlauea’s vog has implications for the impact on hurricanes of polluted air as they approach the U.S. mainland coast. “The Hawaiian Islands provide a unique environment to study this interaction in relative isolation from other influences,” said Businger. He plans to model the interaction of the vog plume and Hurricane Flossie with a more complex model that integrates chemistry into the predictions to better understand the processes at work in this unique confluence. The research was published in Geophysical Research Letters.